FRONTLINE obtained this photograph from John B. Ciravolo, Jr., of New Orleans. Ciravolo was also a C.A.P. member in 1955 and says he was in the same unit with Oswald and was standing right in front of him in the photo. Ciravolo identified David Ferrie, while former C.A.P. 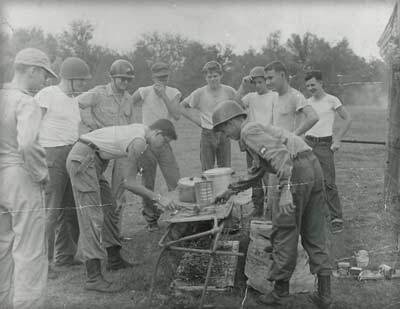 cadet Tony Atzenhoffer, also of New Orleans, identified Oswald and Ferrie in the photograph, and Colin Hammer, who says he served with both men in the C.A.P., also identified both in the photograph. FRONTLINE located the photographer, Chuck Frances, who says he took the picture for the C.A.P. Francis also said that when he was interviewed by the FBI, he told them Oswald and Ferrie knew each other, but he did not tell them about the photograph. The executor of Ferrie's estate, as well as Ferrie's godson, also picked out Ferrie. After the Kennedy assassination, David Ferrie told investigators he never knew Lee Oswald. "I never heard David Ferrie mention Lee Harvey Oswald," said Layton Martens, a former C.A.P. Cadet and a close friend to Ferrie until Ferrie's death in 1967. But when FRONTLINE showed Martens the photograph, he identified Ferrie. "It does indicate the possibity of an associaton," said Martens, "but if and to what extent is another question. Of course we've all been photographed with people, and we could be presented with photographs later and asked, 'Well, do you know this person? Obviously, you must because you've been photographed with them.' Well no, it's just a photograph, and I don't know that person. It's just someone who happened to be in the picture." "As dramatic as the discovery of this photograph is after thirty years," says Michael Sullivan, FRONTLINE executive producer for special projects, "one should be cautious in ascribing its meaning. The photograph does give much support to the eyewitnesses who say they saw Ferrie and Oswald together in the C.A.P., and it makes Ferrie's denials that he ever knew Oswald less credible. But it does not prove that the two men were with each other in 1963, nor that they were involved in a conspiracy to kill the president."